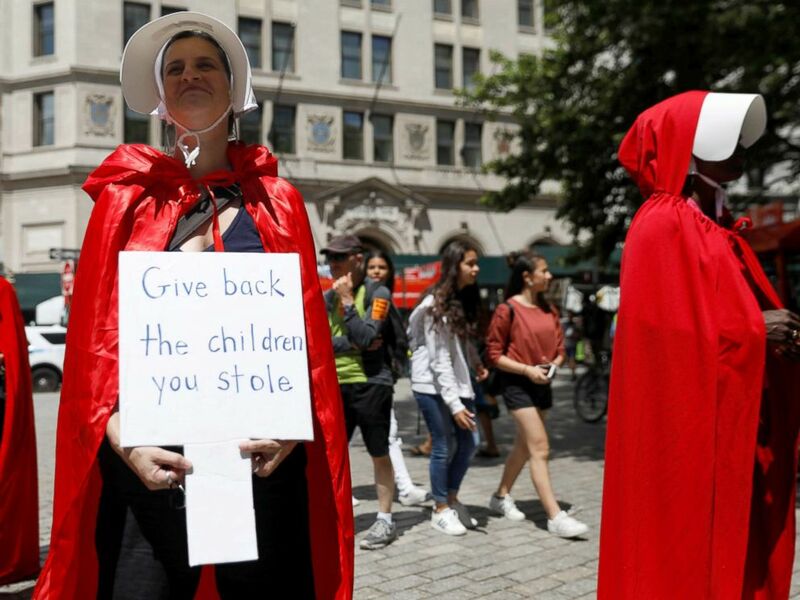 Dozens of women dressed in the red robes and white bonnets of the dystopian drama "The Handmaid's Tale" protested against the Trump administration in Manhattan on Tuesday. Women laid tiny shoes, toys and clothes to represent the migrant children separated from their families in front of the steps of the venue where Vice President Mike Pence and Homeland Security Secretary Kirstjen Nielsen were attending the National Cybersecurity Forum. 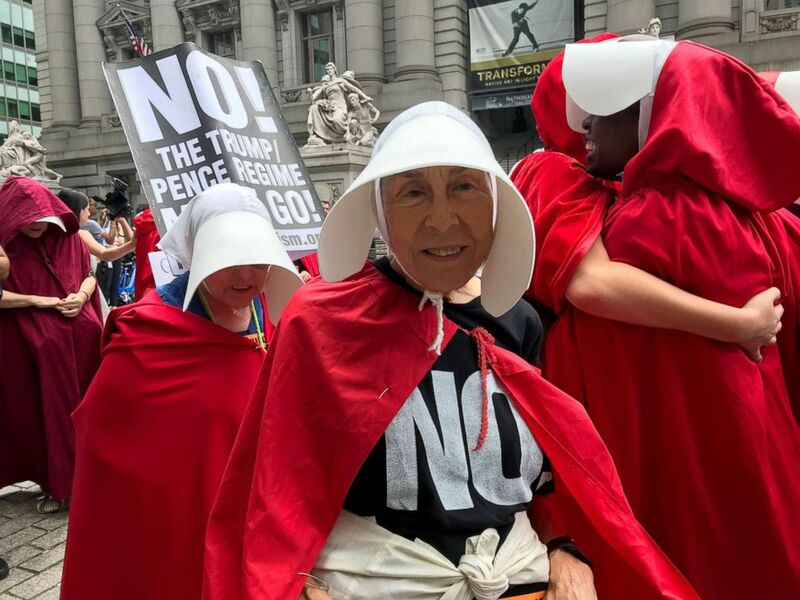 Lillian Forman, 82, was one of the handmaids who protested. She said she felt she couldn't stay home. "I see how America has changed since Trump's presidency and how it will continue to keep changing if he has his policies fulfilled," Forman said. "We're losing our liberties, our law protections, and our balances.I saw what he did to the kids at the border, and if he can do that to little children -- some of them mere babies, literally babies -- he will do anything." 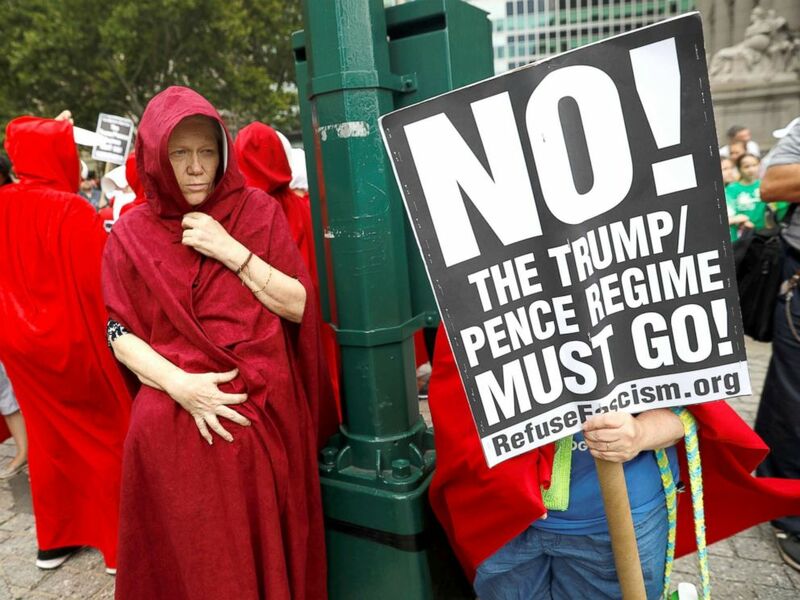 Women dressed in red gowns as worn in the "Handmaids Tale" protest outside the Department of Homeland Security (DHS) Cybersecurity Summit where U.S. Vice President Mike Pence, July 31, 2018, in Manhattan, New York City. Patricia Okoumou, who was arrested for climbing the Statue of Liberty in protest on July 4, also protested as a handmaid outside of the Alexander Hamilton Customs House. "It is an atrocity to imagine that in the 21st century in the United States of America, we are using children as bait for political reasons, for political gain," Okoumou said. "Enough is enough." "The reason I went up there and scaled the Statue of Liberty was for justice," she continued. "I'm sick and tired of being sick and tired. I'm sick and tired of the callous way the Trump administration is handing migrant children. The imprisonment of children has to end and has to stop now." 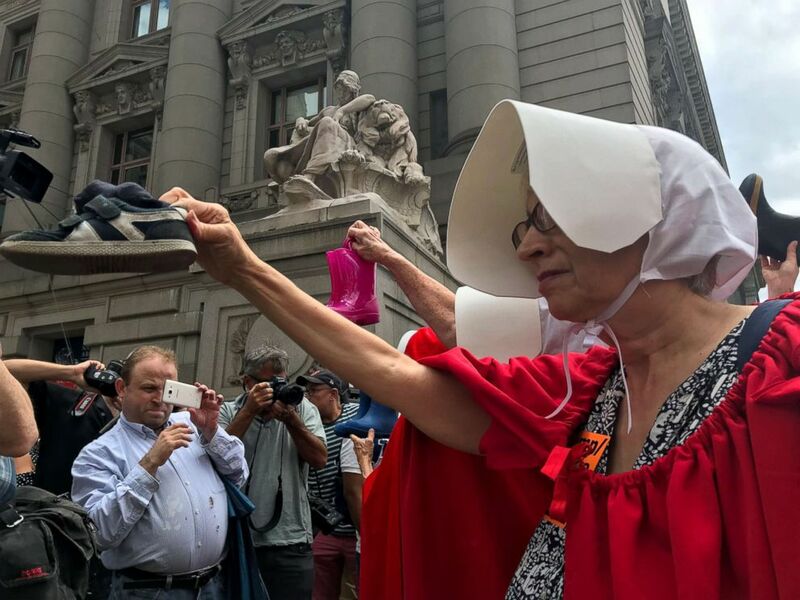 Refuse Fascism, the group behind Tuesday's protest and a similar one in Philadelphia earlier this month, is using "The Handmaid's Tale" as a cautionary one about what happens when women lose their reproductive rights and children are separated from their parents. Women dressed in the robes of "The Handmaid's Tale" express their support for abortion rights and demand that migrant children separated from their parents be reunited during a protest in Manhattan July 31, 2018. The story, first published by Margaret Atwood in 1985 and made into a Hulu drama in 2017, focuses on the Republic of Gilead, a religious society in which fertile women are forced to bear the children of political leaders after losing their rights to property, money, their bodies and custody of their own children. Forman said she read Atwood's book shortly after it was published. "It scared the s--- out of me. I liked it, but I could never read it again because I didn't want to hear it. So I guess I went into a kind of state of denial," Forman said. "I thought [Atwood] was prophetic." 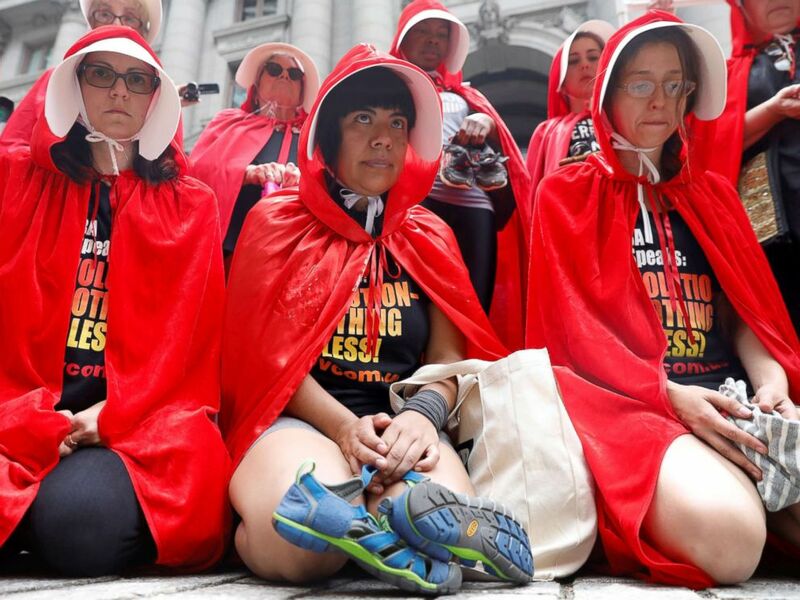 Women dressed in red gowns as worn in the "Handmaids Tale" hold shoes and clothing representing immigrant children separated from their parents as they protest in New York City, July 31, 2018. 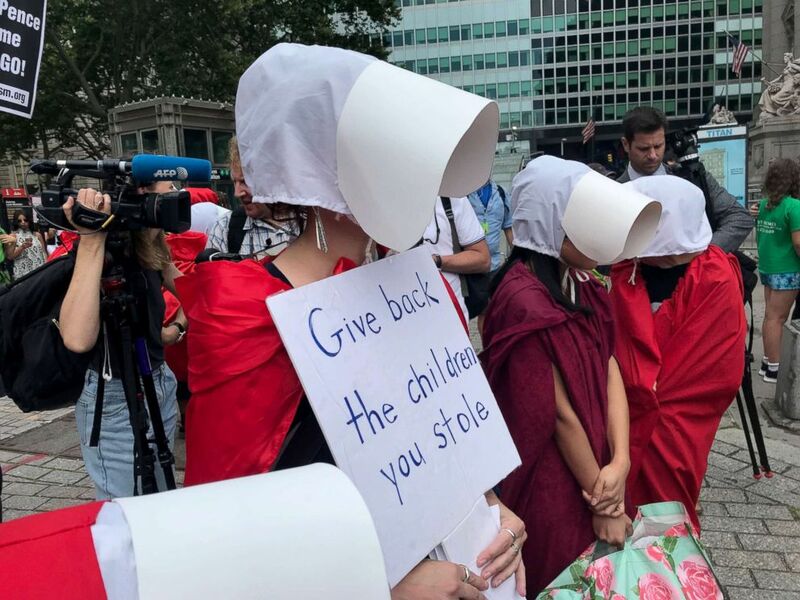 During Tuesday's protest, one handmaid carried a sign that read "Give back the children that you stole." The court-mandated deadline for the Trump administration to reunite all 2,500 immigrant children separated from their parents at the border was July 26. The Trump administration has said it reunited all "eligible" children, but by the end of the day July 26, almost a third -- 711 children -- still had not been reunited with parents, guardians or sponsors. Some of those children's parents had already been deported without them. On Tuesday, immigration officials from the Trump administration testified before Congress about the separation policy, seeming to acknowledge, when questioned by lawmakers, the harm that had been caused. "We raised a number of concerns ... about any policy that would result in family separations due to our concerns for the best interest of the child," Commander Jonathan White of the U.S. Public Health Service Commissioned Corps answered. "Separation of children from their parents entails significant risk of harm to children." Many of the protesters said they were also there to call attention to what they see as an erosion of abortion rights under the Trump administration. Marion Marino, 84, said she remembered what it was like before abortion was legal in the U.S. and "never" thought she would be out in the streets in 2018 trying to save Roe v. Wade. 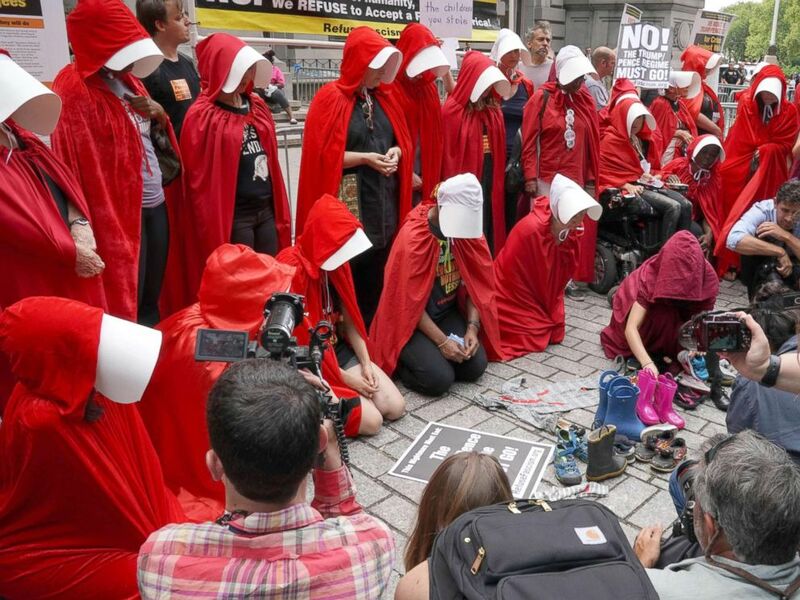 Women dressed dressed as characters from the novel-turned-TV series "The Handmaid's Tale" protest in front of the Alexander Hamilton Customs House, July 31, 2018, in New York City. "After the women's movement, Gloria Steinem and all those brave and important and articulate women, I thought that the fight was over," Marino told ABC News. "And then we got Trump in office and it's all disappearing now." "I see our freedoms as Americans just being lost and no one is putting any kind of fight," Marino added. Vanessa Giraldo, 31, said she has protested as a handmaid four other times, with Refuse Fascism and a pro-reproductive rights organization. "I'm basically here because I will not become a prisoner due to my biology," Giraldo told ABC News. "Why should I have to be subject to unwanted pregnancies and having to raise children that I have no economic means to support, and on top of that, having them slash those economic means to allow a healthy child to grow in this society. I'm not going to go back." 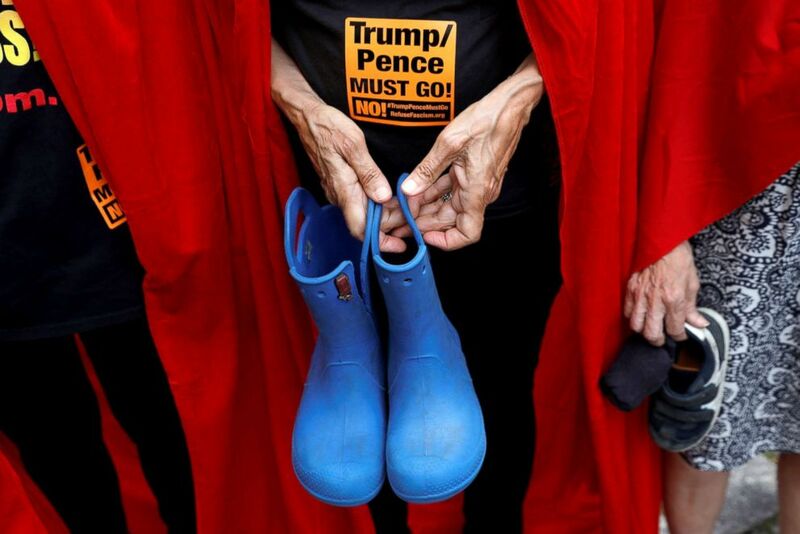 Women dressed in red gowns as worn in the "Handmaids Tale" hold shoes representing immigrant children separated from their parents protest, July 31, 2018, in Manhattan, New York City. Giraldo said she has been a reproductive rights activist since she was 18 and knows women for whom abortion was difficult to access. State-level restrictions have caused clinics to close across the country in recent years, according to the Guttmacher Institute, a reproductive rights research group. Iowa, Louisiana, and Arkansas are three states where multiple abortion clinics have closed, and those states have also proposed new laws that would shorten the time frame that women have to seek legal abortions. Women dressed in red gowns as worn in the "Handmaids Tale" protest U.S. Vice President Mike Pence and Department of Homeland Security (DHS) Secretary Kirstjen Nielsen outside the DHS Cybersecurity Summit in New York City, July 31, 2018. For Giraldo, that reality is part of why she felt the need to protest. "I know several women from other states who had a lot of trouble, who had to get hotel rooms in major cities and make schedules ahead of time, almost right on the cusp, depending on the state's restrictions," Giraldo said. "It was a harrowing experience and most of them spent thousands and thousands of dollars. It's inexcusable we would have to do that in this day and age."